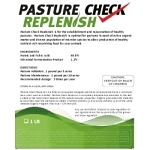 Pasture Check Replenish is for the establishment and rejuvenation of healthy pastures. diverse population of microbe species to allow production of healthy nutrient rich nourishing food for your animals. Pasture Check Replenish is a foliar or soil applied biological plant and soil amendment and is nonphytotoxic when used as directed. 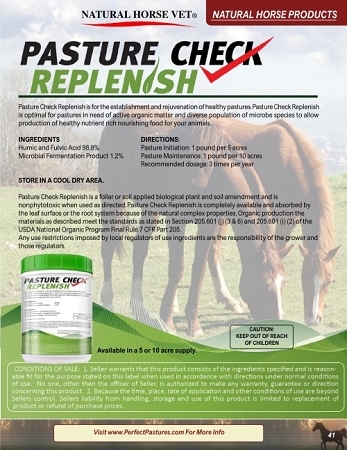 Pasture Check Replenish is completely available and absorbed by the leaf surface or the root system because of the natural complex properties. Organic production the materials as described meet the standards as stated in Section 205.601 (j) (3 & 6) and 205.601 (i) (2) of the USDA National Organic Program Final Rule 7 CFR Part 205. Any use restrictions imposed by local regulators of use ingredients are the responsibility of the grower and those regulators. 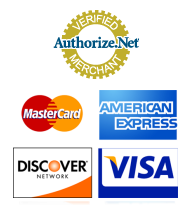 This will provide the info you need to determine the needs for your own situation. It may seem to be a little confusing to apply and thus want to explain carefully. Actually it is simple as mixing the amount of Pasture Check needed for your acreage with water and spraying onto the acreage but the problem is that every sprayer seems to discharge at different amounts so you first have to determine how much water (number of tanks to cover your acreage) is needed to cover your acreage. How much Pasture check to put in each tank though is easy. A five acre package covers 5 acres, a 10 acre package covers 10.. So just divide accordingly for YOUR acreage. The simplest way to determine how fast your sprayer discharges and thus how many tanks of water will be needed is to do a test run with just water. Fill your sprayer tank with water only and see how far the tank goes. THEN determine how many tanks of water you need to cover your acreage, divide the amount of Pasture Check needed into those tanks and start spraying. As an example, if it appears from the trial run with just water that it is going to take 5 tanks to cover your 5 acres then put one 1/5th of the 5 acre Pasture Check package in each tank . If your acreage is only 1 acre, of course you will only be using 1/5th of the entire 5 acre Pasture Check package in the 5 tanks. "Your pasture will never be the same."